In addition to directing the film, Affleck also plays Tony Mendez, the “exfiltarion” specialist who concocts a wild plan to smuggle the diplomats out of Iran under the guise of a location scout for the production of a film that didn’t exist, the Argo of the title. To help with the elaborate ruse Mendez recruits a Hollywood producer (Alan Arkin) and legendary make-up effects artist John Chambers (John Goodman), the man who created the ape make-up for the Planet of the Apes films and also designed Mr. Spock’s pointed Vulcan ears for the original Star Trek TV series. Chambers’ exceptional skills with make-up were used by the CIA on numerous occasions. Michael Parks, recently seen spewing fire and brimstone (not literally) in Kevin Smith’s Red State, plays comics legend Jack Kirby, whose unused concept art for a film adaptation of the Roger Zelazny novel Lord of Light was used by the CIA as part of their film production cover story. Co-starring alongside Affleck are Bryan Cranston, Kyle Chandler, Victor Garber, Clea DuVall, Rory Cochrane, and B-movie goddess Adrienne Barbeau to name but a few. 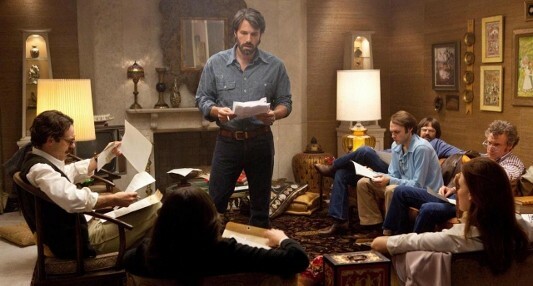 Argo opens on October 12, 2012.